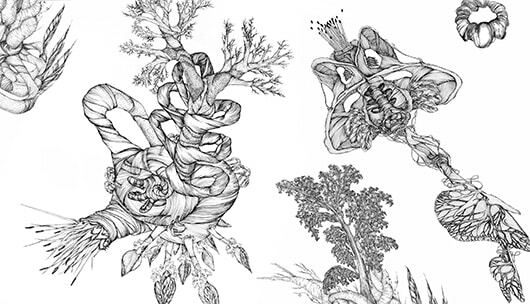 Mixing biology, ecology, and fantasy, Maggie Nowinski’s DRAWN wHOLE presents a series of drawn works that explore systems, both social and biological. Her linework mimics both historic woodcut illustrations and scientific illustrations, creating new specimens out of recognizable shapes and parts. Curated by David Borawski, DRAWN wHOLE opens Thursday, October 18 from 6-8 PM during Creative Cocktail Hour. For more information about Nowinski and her work, click here to visit her website. Maggie Nowinski is an interdisciplinary visual artist, arts educator and curator who lives and works in Western Massachusetts and has an active exhibition record, showing work regionally, nationally and abroad. She is the recipient of numerous LCC grants through the Massachusetts Cultural Council. In 2017, she was the recipient of the Berkshire Taconic Foundation Artist Resource Trust Fellowship which partially supports her work in this current exhibition. She received her BFA in 1997 and her MFA in 2007. While her process is rooted in drawing, her artworks frequently take the format of installation and combine traditional and unusual media, audio, video and performative processes. Her work often responds specifically to site or material, and her process is embodied by an awareness of the conceptual and political inevitability of art making. She is also fond of collaborations. Nowinski is adjunct faculty at Westfield State University in Massachusetts and Manchester Community College in Connecticut and is Artist-Mentor with Vermont College of Fine Arts in the MFA/Visual Arts Program.